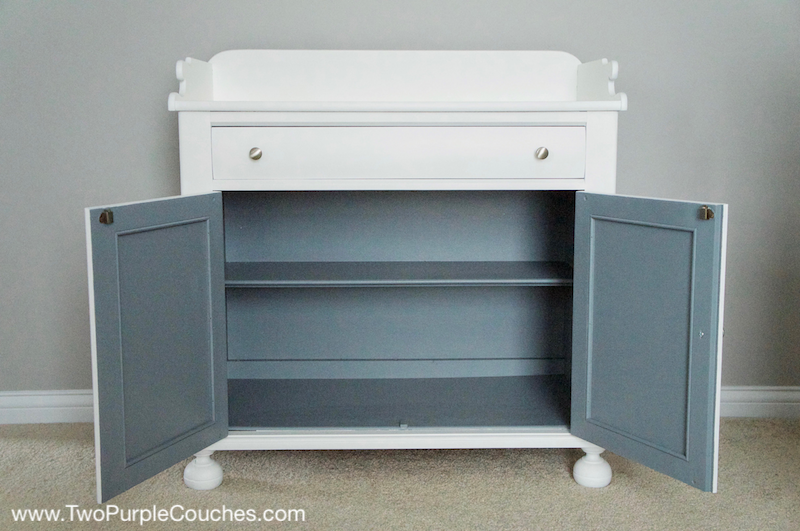 How to paint furniture with a paint sprayer—an easy DIY way to repurpose old pieces. The quickest way to get that “before and after” look! Painting furniture is like a rite of passage amongst DIY-ers, but I’ll admit, it’s always been intimidating to me. From the sanding and prep work to the time you actually spend with a brush in your hand, it all seemed like a lot of work. And what if the end result wasn’t what you were hoping for? Cue the DIY-anxiety. But my attitude has changed, and my DIY-anxiety has been alleviated with the help of one easy-to-use tool: a paint sprayer. I’ve been lucky enough to have the opportunity to meet the Wagner SprayTech team at several blogging conferences and work with them during my home office makeover a year ago. (Click here to see more about my office makeover). 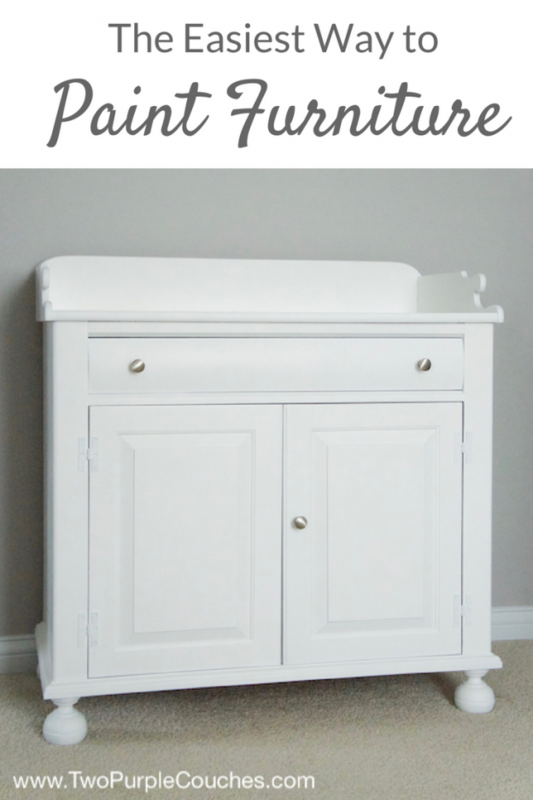 I recently was able to partner with Wagner again to complete a furniture makeover for our daughter’s nursery, and now I’m a total paint sprayer convert! 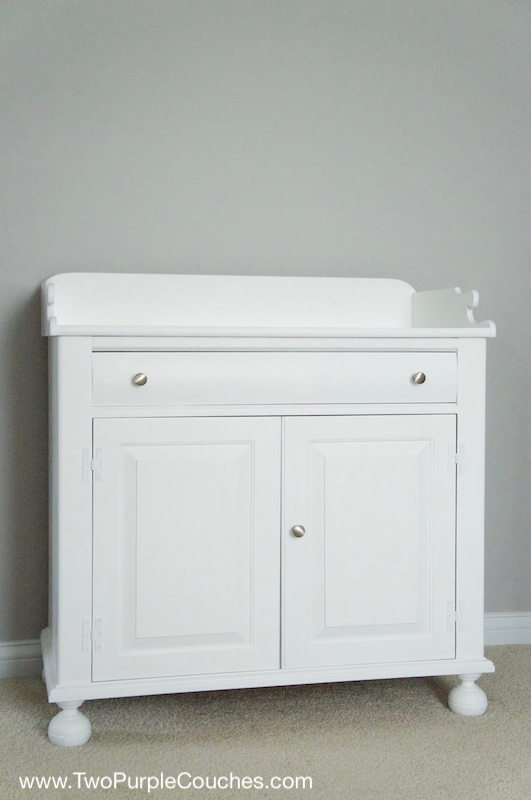 We had an old vintage wash stand that I wanted to convert to a changing table. The piece was in great shape, but it needed a fresh coat of paint, inside and out. We used our Wagner Studio Plus paint sprayer and Studio Spray Tent to give this old cabinet a whole new look in one afternoon! Click here to read more about our changing table makeover. 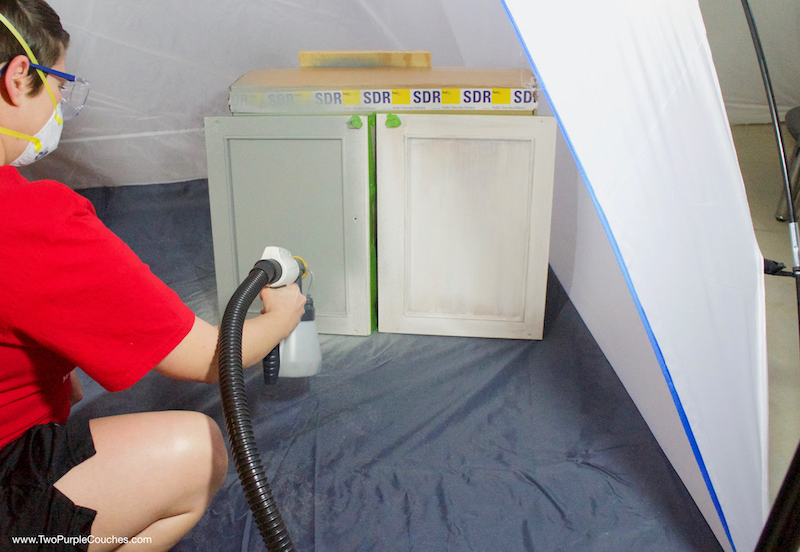 Using a paint sprayer is seriously the easiest way to paint furniture. There is about the same amount of prep work required. You still need to thoroughly clean and/or sand your piece of furniture, remove any hardware, etc, but the actual time spent painting goes SO quickly. It’s awesome to see your effort pay off almost instantly! 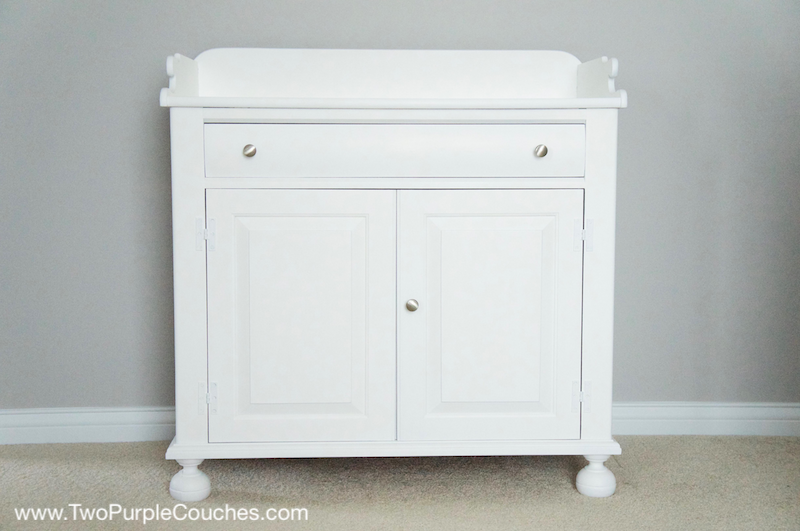 Now that I’ve had the chance to work with Wagner paint sprayers on a few different projects, I’ve discovered some simple tips for easier furniture makeovers. Check these out the next time you’re gearing up to paint furniture. Whether you’re a paint sprayer newbie or not, have some scrap wood on-hand for practice. This way you’ll get a better feel for how the paint is flowing through the sprayer (is it too thin? too thick? ), whether you need to adjust the flow settings, move slower or quicker, etc. Test before each use and especially if you’re using more than one color to complete the project. Move at a good, steady pace. This builds on the tip above, but as you use the sprayer, you’ll get a feel for the speed at which you should work. Too slow means drips and puddles can form on your furniture; too fast and coverage will be spotty. Work in a well-lit space. If you’re inside or in a garage, have moveable lights to help make sure you’re getting good coverage, especially if you’re using a light-colored or white paint. Read all instructions for clean-up. Cleaning out the sprayer isn’t difficult, but knowing and following the steps in the correct order will save you time in the long run. (Ask my husband how he knows). Be sure to thoroughly rinse all the paint from the canister, and then disassemble all of the nozzle pieces. 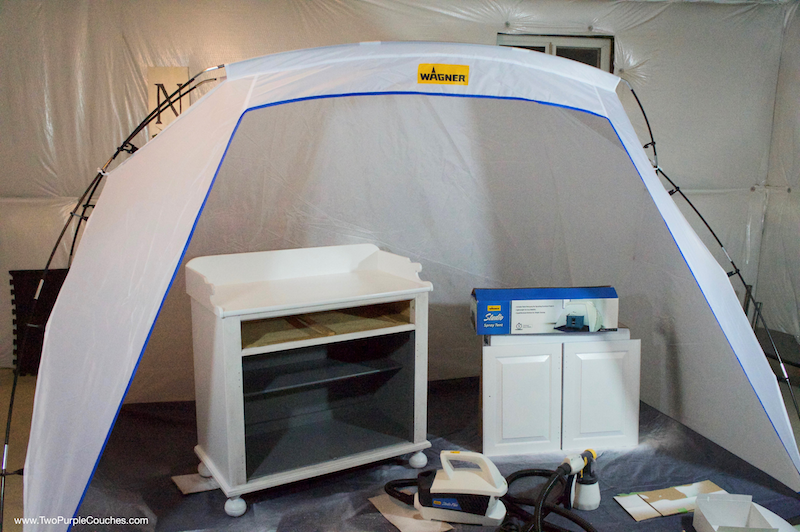 If you’re working with larger pieces of furniture, the Wagner Studio Spray Tent is a must-have! It’s lightweight, fairly easy to put together, and you won’t have to worry about overspray. I am notorious for painting things from overspray that don’t need to be painted—like our garage floors. Oops! But the spray tent keeps our workspace clean, whether we’re working indoors or out. 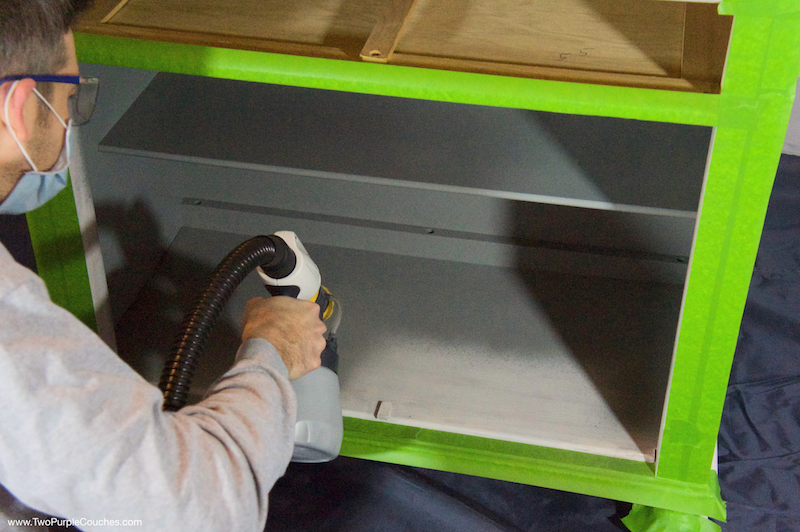 Follow these tips when using your paint sprayer and you’ll be a pro at how to paint furniture in no time! This entry was posted in Made It Myself on May 24, 2018 by Two Purple Couches. What a pretty makeover! I love the sprayer I use and can’t imagine tackling a paint DIY project without it! Good job:) Pinned ! I really need a paint sprayer! I have two big furniture pieces to make over and this would make it soooo much easier!! Oh yes! A sprayer would make a huge difference! Wow! This piece looks great. I love using a paint sprayer. I love the contrasting color on the inside of this! Paint sprayers are the best, now I just need one of those tents! Pinning! You look like a spray-painting pro! This project turned turned out perfectly! Thanks ladies! I’m so pleased with how this turned out!